Blu-ray review: Skyfall | What Hi-Fi? After a certain age, franchises seem to feel the need for self-mockery. The last instalments of Indiana Jones and Mission: Impossible both demonstrate this when their heroes hilariously misjudge a stunt. Now it’s 007’s turn, fluffing a motorbike jump at the beginning of Skyfall. There are also enough jabs at age throughout the film to suggest that this will be Bond’s last hurrah. The spy goes on, however, defiantly adjusting his cufflink after landing on a moving train. He’s not giving up that easily. Marking the franchise’s 50th anniversary, Skyfall is a labour of love. From the disc’s generous bonus features, it’s clear that the cast and crew took this project very personally. This doesn’t follow on from 2008’s Quantum of Solace: it’s a sequel to every Bond film ever made. Many things are just as they used to be – just as they ought to be. Certain roles return, including an updated, understated Q. Bond is armed with a handful of gadgets, more than a handful of innuendoes, and That Car. The presence of the Aston Martin DB5 makes no real chronological sense, but the folks at Eon Productions seem more concerned about fan service than anything else. Above all, Skyfall returns to a sense of fun. Javier Bardem’s peroxide villain is deliciously hammy, while Craig’s Bond finally seems at ease cracking one-liners. Some of the puns feel a little laboured, but there’s a lighter, mildly camp tone that was missing from the past two outings. Alas, all this nostalgia doesn’t leave room for much else. The story is a little thin, and despite an intriguing start, where M’s past returns to haunt her, it quickly becomes a by-the-numbers chase – not nearly as interesting as Casino Royale. There’s also an attempt to dig deeper into Bond’s past. It takes the story down a darker, moodier path, which feels at odds with the newly rediscovered sense of levity. Not necessarily the best Bond movie, then, but it may be the best-looking. One of our favourite parts is a neon-lit sequence in a glass labyrinth, which culminates in a silhouetted punch-up. It’s slick, smooth and ever so stylish, effortlessly raising the bar for action cinematography. The Blu-ray’s quality is stunning: it’s pin-sharp, and contrasts are strong. From the warm lantern-orange of Macau to the cold, bright whites of London, the colours are punchy and clean. Audio quality from the 5.1-channel DTS HD Master Audio soundtrack is also high: dialogue is crisp and clear, the DB5 rumbles with enthusiasm and Adele’s rendition of ‘Sky-foal’ has plenty of emotion. Over the years, the world’s most famous spy has had many rivals and imitators. Around the time of the invisible car, the likes of Jason Bourne and Jack Bauer were credible threats to Bond’s relevance. 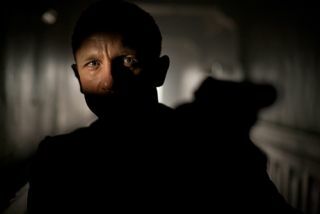 Skyfall demonstrates that, when done correctly, nobody does it better. HMV's previously exclusive deal to sell the gorgeous steelbook edition of Skyfall has been snapped up by Amazon. Better get in there quick!